Renzo Piano and Alvisi Kirimoto + partners have added a vibrant and ever-changing installation to the rustic Piazza Faber in Sardinia. 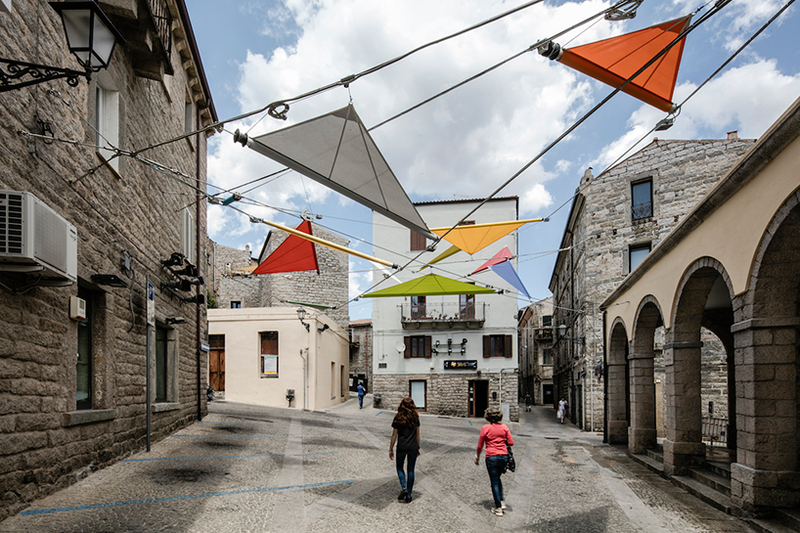 In Tempio Pausania, a town of about 14,000 inhabitants in the Northern part of the island, the architects have realised a series of colourful sails that fluctuate in the sky, animating overhead pedestrians and passersby to the lively public space. 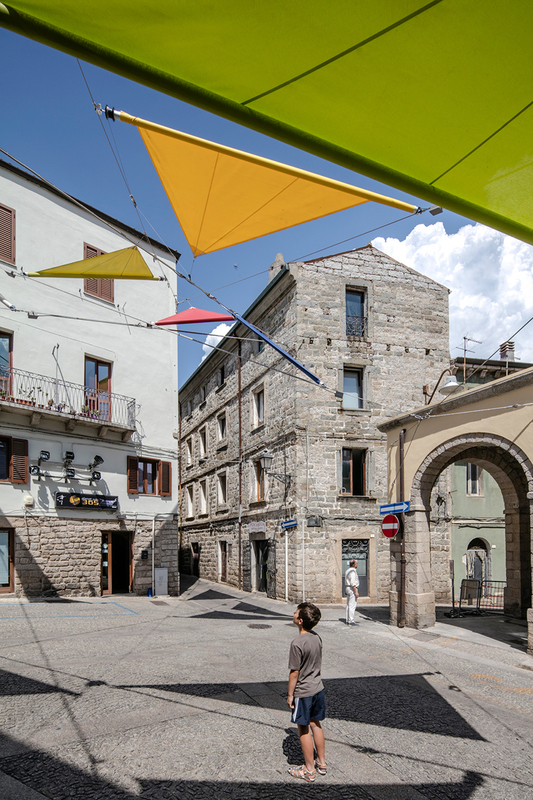 The project is dedicated to the late Italian singer-songwriter Fabrizio de André — whose friendship with Renzo Piano became an important source of the project — the installation serves not only to celebrate the artist as ‘one the most sensitive interpreters of human nature’, but also to highlight the beauty and importance of small towns across Italy. The project was developed by Alvisi Kirimoto + partners, and it comprises 12 suspended elements set against a backdrop of historical stone buildings and the market arcade. In celebration of the light and colours of the landscape, green, gold, red and blue fabric sails fluctuate in the air as if carried by the wind, finally resting on a web of wires that stretch between the buildings. Piano’s idea of a ‘spiderweb’ of colour is translated into a labyrinth of wires and cloth that don’t touch the piazza, but give it a dynamic effect of shadow and colour. When the sails are closed, ’12 coloured pencils’ (a reference to Fabrizio de André’s great passion for Faber-Castell crayons) seem to be suspended between the narrow irregular streets and granite walls. In its construction, the installation includes an arrangement of steel cables anchored to the granite walls of the surrounding buildings. This net creates a series of suspended triangles, where each vertex acts as the starting point for other rods. The fabric geometries can be rolled up though a motorised system — similar to those used in sailing. 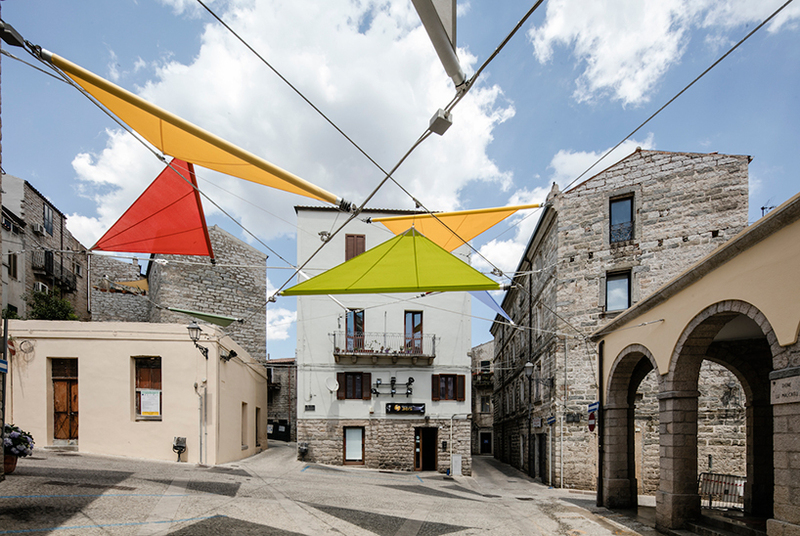 The device allows for two distinct configurations: open sails produce triangles of shadows in the piazza; closed sails form an intricate system of cables and rolls overhead. Additionally, the open composition can also host visual projections, adding another dimension to the ever-changing installation.